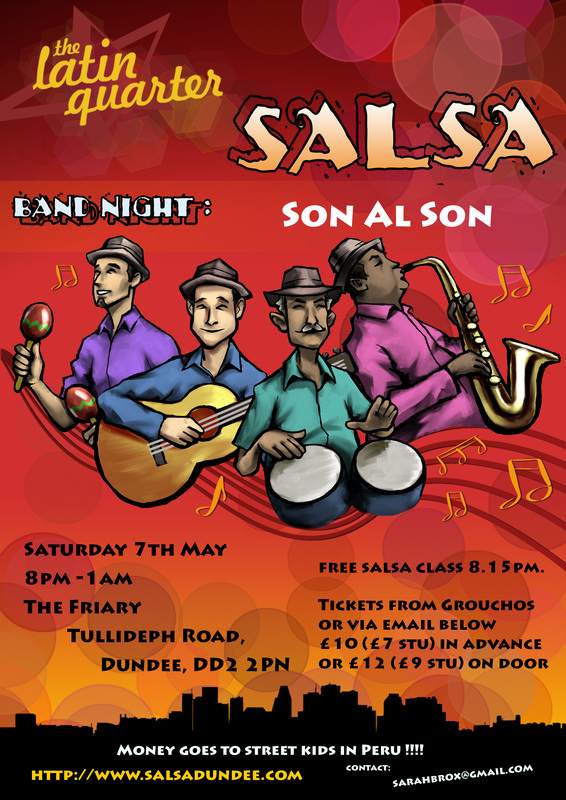 Latin Quarter presents CHARITY SALSA BAND NIGHT with Son Al Son, Latin band on Sat 7th May at The Friary, Tullideph Rd, Dundee DD2 2PN to raise money for the Azul Wasi project for street children near Cusco, Peru. Doors open 8pm, salsa beginners class at 8.15pm, on till 12.30am. There’s a raffle too. Venue has large wooden dance floor. Tickets available with a £2 discount if paid in advance from Grouchos ( Dundee, from mon 11th april) or from Sarah at classes. Otherwise tickets are £12 or £9 (stu) on the door on the night. If folks are coming together you can reserve a table for between 8 & 12 people by emailing sarahbrox@gmail.com. Please help advertise , click on the poster & pop one up somewhere if you can. Information about the band, Son al Son was formed in 2008. Its line-up is made up of musicians from Cuba, Ricardo Fernandes Pompa,(Lead Vocals and Bongos) Eric Alfonso (Congas) and from Scotland, Bob Thomson (Bass) and Lorne Cowieson (Trumpet)with Lino Rocha on Vocals and Guiro and Simon Gall on Piano and Vocals. As the name suggests, Son al Son play son, a style of music made popular in 1920’s Havana and more recently in the film “Buena Vista Social Club”. To this day, songs like Chan Chan, El Cuarto Del Tula and Dos Gardenias are played in cafes and bars across Cuba,Son al Son have recreated this sound to bring a little bit of Havana to you. Son al Son play a lively set of traditional Cuban songs guaranteed to get your feet tapping and out of your seat in no time, Gozar! Enjoy!.